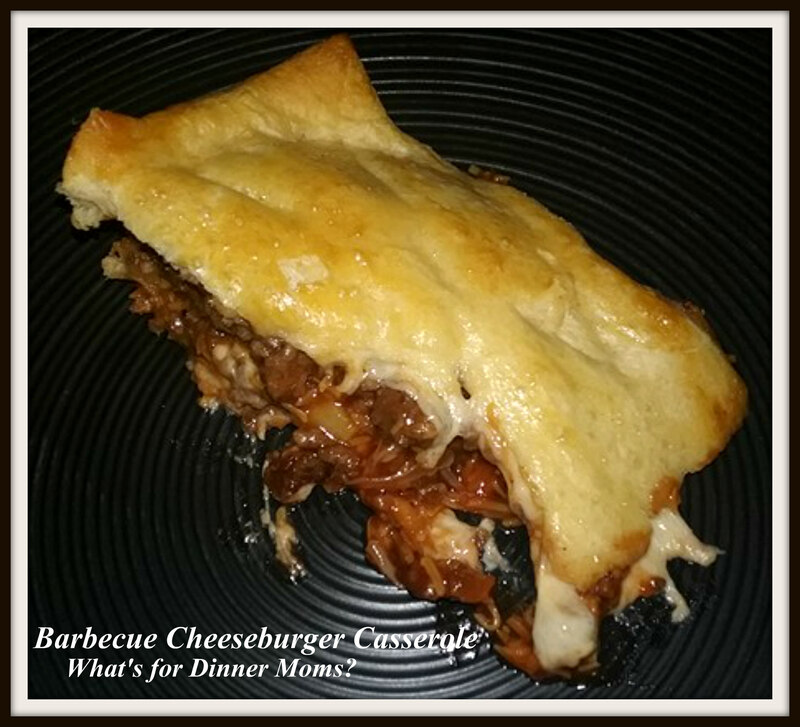 Barbecue Cheeseburger Casserole – What's for Dinner Moms? As I am away working this week my family is really helping me out. They are cooking and taking pictures for me as I feed them ideas. They are the best! The other day we took out 3 lbs. of ground beef to thaw. Once it thawed I wanted to cook it so we could have it in the refrigerator to make a few simple quick meals. I did cook the ground beef with onions, salt, black pepper, and minced garlic because we use onions and garlic in almost all of our dinners. We were able to take it out of the refrigerator and make a simple dinner and with a green salad dinner was on the table in a little over 30 minutes. My kids thought this was something fun and different. I was okay with it. I am not a fan of crescent rolls but my kids love them with “stuff.” If they want a roll they want a croissant but if they want a crust they like those little canned things. Weird children I have. Prepare a pan with 8″x 8″ pan with non-stick spray. Heat oven to 350 degrees. Brown ground beef, onion, and garlic in skillet over medium heat breaking it up as you go into small pieces. Once meat is cooked through drain any grease from the pan. Add tomatoes, barbecue sauce, 1/2 cup cheddar cheese, and pickles to pan. Stir well and cook to warmed through. Liquid should be mostly evaporated and thick. Open one can of crescent rolls and press them into the bottom of the prepared pan sealing the seams with your fingers. Pour the ground beef mix into the pan. Spread around the pan. Cover the top with the second can of crescent rolls pressing to seal. Spray a piece of aluminum foil with non-stick spray and cover dish with non-stick side down. Bake about 20 minutes in oven. Remove pan, uncover, sprinkle remaining 1/2 cup of cheese (if desired) and return to oven for 10-15 minutes until cheese melts. Watch bottom crust that it does not burn! Remove from oven and allow to sit for 5 minutes before cutting. Drizzle with barbecue sauce if desired. That really looks yummy, and we buy the same brand of barbecue sauce ! My kids are so lucky about barbecue sauce! Even when I make it to them it “doesn’t taste right.” Has to be Sweet Baby Ray’s. Now that sure looks tempting! That’s such a good idea. You all are so creative!